Wild performance art, drugs and punk rock. It was into this take-no-prisoners landscape that Artists Television Access was born just as video was surfacing as a populist art tool in early 80's San Francisco. Hooking up at the San Francisco Art Institute, Marshall Weber and John Martin decided to form Martin/Weber Gallery in a funky live-in warehouse on 8th St. in the pre-gentrified Soma district. It was a buoyant mix of drug den bachelor pad, socially conscious editing suite, and gutsy exhibition space that cut a unique swath into the alternative art scene. The space might still be there today were it not for the disastrous Halloween night of 1986. Marshall, returning from a Iggy Pop concert found the building in flames and his smoldering possesions being stomped on by firemen out in the street. The cause of the fire was never pinpointed, though rumor had it that Marshall's highly prized set of polyester suits had perhaps spontaneously combusted. Six months later ATA began its reign on Valencia St., where after more than a decade it remains a viable artists nexus. Starting ATA: Well we decided let's put together a gallery in San Francisco... Both of our parents gave us money and that's the irony of ATA - how it was started. My father was an engineer for Bechtel designing nuclear power plants and Marshall's father was a jeweler in Connecticut. They basically gave us the seed money to start. The First Space: Yeah, we lived there. (laughs) It was about the most fun time I've ever had in my life. Yeah we were on drugs constantly. We didn't sleep. We built the place - we wanted to get it finished so we never slept. We would sleep in shifts. It was extremely intense. We built an entire editing room; the walls, the floors, everything... We had this idea that we were going to start making money which was wrong but it was still a lot of fun. We had so much fun it was amazing. ATA's official opening: Our parents were there, all the San Francisco punk scene was there and the art scene. Six hundred people showed up- the fire department showed up. It was a real blast. 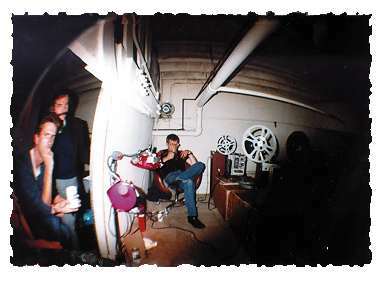 Projection Room on 8th St.
Why we started it:To explain what SF was like in 1982, 83, when we started Artists' TV Access, you have to imagine a place where most of the major art venues did not show video art yet and there was no video art or media curator at the MOMA. Most of the performance and gallery spaces were started in the 70s by people who were mostly doing body performance and installation...not traditional art forms but not heavily influenced by media. 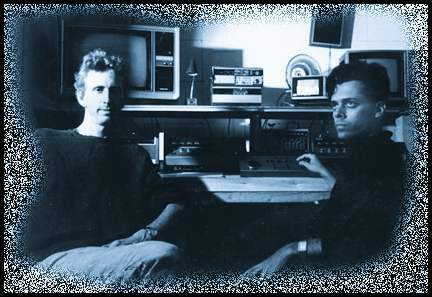 We knew that if we wanted to make video art we had to have our own equipment becaue we couldn't afford to use 3/4" systems and there was no access to the schools anymore. And we certainly couldn't afford even the non-profit places like BAVC and Video Free America. Here we were... this little cool television production place, but we were primarily identified as artists so we had this warehouse space and people came to us and say we want to hang an art show in the gallery or we want to do a music show here. So we were like cool, let's do it, let's video tape it. And then the other thing was that we made money off this editing system... a few months into it. Back then if Macy's wanted a fashion show video taped they either hired someone from a television crew...or they found someone like me and John. And they gave us some bucks. But we wanted people on the streets to come into our gallery to use our services. So it was kind of naive outreach where we kind of talked to people "you know if you're on any kind of general assistance you can use our editing system for free." We literally had a 100% subsidy program for almost 2 years. We also had an honest political committment to access, working with the Teen Parenting Program at SF General, Earth First, ACT-UP etc. How we turned non-profit: We were meeting people who were from different walks of life, we hung around a pretty diverse group of people anyways and it seemed like, okay let's go non-profit. We could get public funding real easily. For instance around the corner from us was New Langton Arts and Renny Pritikin and Judy Moran were running it then and they thought it was really cool that some youngsters were opening up a gallery video place. When we first opened up we would supply video services to New Langton because they didn't have the stuff even though they had been existing already for 10 years. They were just getting into media, they were really supportive. There's alot of people who were really supportive. In the sense that, hey how can we help? And the people who were really supportive were from non-profit galleries. So you have people like Rene Yanez, who was working at Galeria de la Raza saying you know "you guys have to go for it" you know "you have gotta get off your little YUPSTER butts and do the work". And we had people on what was going to be our board, so the idea caught fire and so okay lets go non-profit and in 1982, 83 it was actually pretty easy to do. When we sent in our first application to the IRS the agent calls us back and goes "what's video art?". I mean you know its like virgin territory here, I mean they were clueless. So unlike today where you say video art and the IRS says oh MTV, you're going to make money, our agent said, "Oh my god, this is compeletely esoteric and ridiculous you guys are never going to make money off of this". And boom months later we got our non-profit, our federal non-profit status. And this hey day only lasted a few years because by 1985 you can go through the yellow pages and there's 100 video production houses in the Bay Area alone. But it was that funny time. The economic perogative fit with what we wanted to do because it was not like we were crafty business people. WE still never made money, we kept the place open. And we got experienced people to work with us. We got our tax-exempt status, we got grants from the NEA. ATA was probably one of the only artists-run media arts organization in the country to consistently get NEA money for a visual arts organization, they didn't even have media arts category when we first applied. Weber and Martin really had a pulse on who was under 30 and who was extremely good and extremely hot years before they got hot. No one was buying so they would come to me like good art dealers should, saying, "Don't be stupid, this stuff is good". They had created this wild underground scene. They were doing this wild programming. In a way they were kind of living it because it (ATA) was their house in a way. It was curious, ATA started in 1984... When ATA was first established by John Martin and Marshall Weber their original intention was to have a hip trendy South of Market gallery that was going to pay for itself, which in the '80's was quite conceivable. Where they fell down was - they actually really wanted to support artists and engender an environment where work was going to be made. That is a bit of a contradiction for a "for profit" gallery. It took them about a year to realize that the gallery wasn't going to work as a commercial venture. So we all had to scramble around fast to figure out how we were going to make money fast and also run the gallery. I think it was a great prototype for many galleries that followed in San Francisco. ATA is unique in that half its income is generated in-kind. Actually, it makes its own money. Even when it went non -profit, because of its video production componet and its pro-education stance, it has been able to support itself. On the fire: There was a noise band playing at ATA on Halloween night who were particulary grating and noxious; most of the audience were chased away. The band was grinding and screeching away and had a tape machine going to document their concert. Though I wasn't at the show, I got a chance to hear the tape later. In the midst of the "music", John Martin runs up to the band , yelling "Get out of here!, there is a fire"... and then you hear the band making a hasty exit. After a minute you hear the flames crackling like a loud barbecue. How often do you hear a building burning from the inside? Chunks of ceiling coming down could be heard hitting the drum set. One of the most haunting parts is hearing the fire engine down the street just like you always do but from the perspective of the building being burnt. The tape kept rolling even though everyone was evacuated. Next you hear the firemen chopping everything with axes, and the sound of extinguishers and hoses. After the fire is under control (one assumes) one of the fireman comes up to the band area and can be heard doing an impromptu drum solo. I was there the next day and Marshall gave me a tour. We swatted around broken glass like hockey pucks amidst the black ash and inches of water. He showing me a stack of videotapes that were fused by the heat into a human head shape and said "these were all my videos, all my work...". It's not often one's lifework gets condensed down into one convienient sculpture.